Well, it’s time to select the topic for my first ‘Game in a Week’ project, which will formally begin tomorrow. 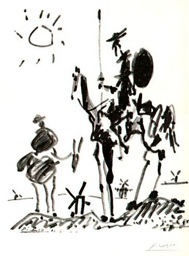 I’ve selected a book from my bookshelf; Don Quixote, by Cervantes. This is a Penguin Classics edition, translated by J. M. Cohen. This particular copy of the book may charitably be described as “well loved”, but it’s still in good enough shape to provide a spark of inspiration for this first game, and it seems a very appropriate book to use. Beauteous damsel, your petition is ill-timed, for I am prevented from embarking on any other adventure until I have brought the one to which I have pledged myself to a successful conclusion. …and I’ve no clue what I’m going to do with that. I’m sure I can work a damsel in, and perhaps something about being “ill-timed” or even some gameplay element about making petitions or pledges.. Oh well; I guess I’ll have my designing work cut out for me tomorrow! 6 January, 2008 in #1: Petition Damsel, Game in a Week.